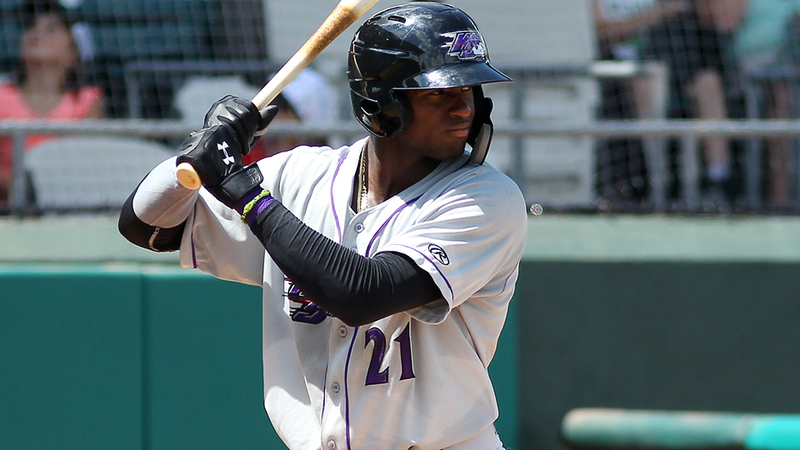 After missing a significant portion of the 2018 season battling injuries, Luis Robert is making up for lost time right out of the gate this year. MLB.com's No. 38 overall prospect is off to a torrid start with Class A Advanced Winston-Salem, earning Carolina League Offensive Player of the Week for April 4-14 after going 19-for-40 (.475) with five homers, two triples, three doubles, 15 RBIs, 13 runs scored and three stolen bases through his first nine games. "Everybody knows what he's capable of since the day we signed him," Winston-Salem skipper Justin Jirschele said. "His tools are off the charts, he's electric in everything that he does, and obviously he's putting it all together here in the early going and off to a tremendous start in all facets of the game." After hitting a grand slam in his first Spring Training start last year, Robert injured his left thumb on March 7 and didn't make his regular season debut until June 5 with Class A Kannapolis. The 21-year-old made it through 13 games with the Intimidators before being called up to Winston-Salem. Nine games into his time with the Dash, Robert injured the same thumb and was sidelined for almost four weeks. After a five game rehab stint in the Rookie-level Arizona League, Robert returned to the Dash and posted a .244/.317/.309 slash line in 32 games. With a clean bill of health, the fourth-ranked White Sox prospect put his talent on full display in big league camp this year, batting .313/.313/.813 with a dinger, a pair of triples, a double and eight RBIs over eight games. Robert brought that momentum into the season and made a huge splash on Opening Night, delivering the first multi-homer game of his career as well as a personal-best five RBIs to propel the Dash to a 9-4 victory in Frederick. "I'm definitely a lot more comfortable this year," Robert told MiLB.com's Michael Avallone through an interpreter after that Opening Night triumph. "Especially coming off a second Spring Training and having played [in Winston-Salem] a little last year. I felt a lot more relaxed coming into the season knowing my surroundings. Going back to my time playing in Cuba, I've always been healthy. It was frustrating to miss time last year, but I just want to stay on the field this season, get better and hope for good results." Robert has hit safely in eight of his first nine games and collected multiple hits in every one of those contests. He has driven in at least one run seven times and scored at least once six times. The Cuba native also delivered a pair of go-ahead blasts in the eighth inning or later for the Dash, including a two-run roundtripper that was the difference in Winston-Salem's 8-6 home-opening victory on April 11. "I felt really good, going all the way back to Spring Training," Robert said. "I think [having a good spring] relaxed me and made me feel more comfortable. Being in big league camp for a few weeks and playing well with other prospects and big leaguers was good for me. It gave me even more confidence coming back down to the Minors." His 65-grade speed has also been featured as he's swiped three bags, hit two triples and legged out a few infield singles already. "I think his bat overshadows everything else he does, like in the outfield and as a baserunner," Jirschele said of the center fielder who has not committed an error and recorded an outfield assist in 17 total chances. "Like I said, he's electric in every single thing that he does, and he's a game changer any time he steps on that field."